My usual answer is an immediate “No,” but this time was different. The Yale Peabody Museum of Natural History, located a mile or so from our dojo in New Haven, Conn., was opening a new exhibit called Samurai and the Culture of Japan’s Great Peace. The museum wanted martial arts demonstrations related the exhibit and asked Fire Horse Aikido to take part. The Peabody is close and familiar to our members, plus the exhibit seemed relevant to our practice. I thought it over for a bit and say yes to a demo for the first time in my dojo’s seven-year history. That stress was even more magnified at the public demos we used to do as part of Summer Camp. The demos seemed to go on for hours and the stakes seemed immeasurable, though usually only a few dozen “civilians” would attend to watch. Blood always seemed to flow. After years of these demos, Sensei decided that they weren’t the most effective way to attract members and we let them go. Keeping my doubts about demos at bay, I marshaled the Fire Horse crew for the event at the Peabody Museum on March 28, 2015. Everything went off without a hitch in front of a hundred or so spectators. The kids loved being part of it and we got lots of interest from observers and saw increased traffic on our dojo website and social media. Putting together the “highlight reel” of the demo above was also lots of fun and appreciated by friends and family. I might be saying yes to more demos in the future, but I wonder if other Birankai teachers have ideas about how to make them better. 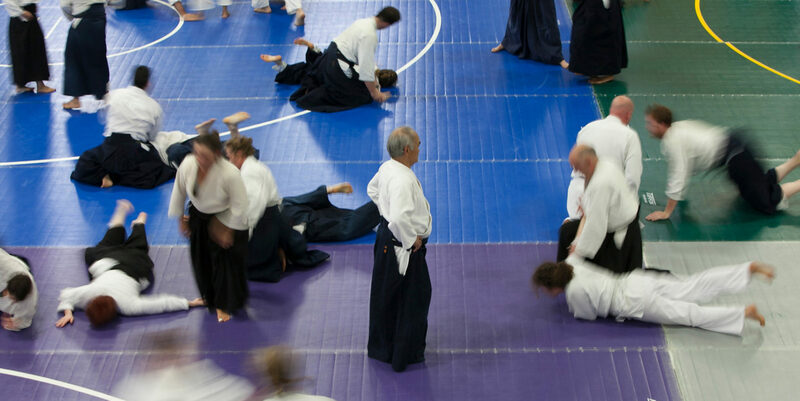 Do you demonstrate Aikido in your community? Is it something we should be seeking out to promote our art?